Crossed eyes (or strabismus) occur when a person’s eyes are not able to align on the same point at the same time, and appear to be misaligned or pointed in different directions. Usually this results from weakness of the muscles in one or both eyes. The weak eye will turn in toward the nose and away from the object that it is supposed to be focused on. The eye that turns off-target may be the same in every incidence, or it could be a different eye at different times. In the initial stages, crossed eyes can cause disorientation or double vision because the eyes don't align together. 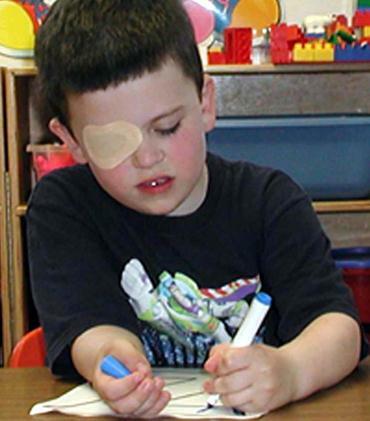 A young child with strabismus will unconsciously reject the image of the improperly aligned eye and the related nerve connections between their eye and brain may fail to develop. This can lead to the eye remaining permanently turned – known as amblyopia, or lazy eye. Crossed eyes develop most often in babies. It is easier to correct when caught early. This is is often not a condition babies or children simply outgrow so children with eyes that seem to be misaligned should be examined and treated if necessary. There are many different causes for crossed eyes and it does seem to run in families. In some cases, it may be caused by severe longsightedness that has been left untreated. Significant head trauma may also cause crossed eyes, as it can affect the portion of the brain that controls eye muscles.